Sponsor a Mile & Help Us Get One Step Closer to a Cure! Show your support for kids with brain tumors as I run in the 2018 TCS NYC Marathon to honor my brave patients who have battled against rare brain tumors. 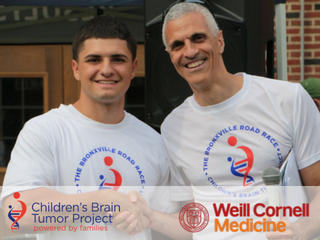 When you make a donation to sponsor a mile, you are supporting the strategic lab work at the Children's Brain Tumor Project, Weill Cornell Medicine, that is focused on accelerating cures for every child facing these heartbreaking diagnoses. If you sponsor a mile at any level, I will proudly wear your individual or company/nonprofit name on my marathon tee. In fact, it will be my honor. Just one last stretch to get me over my $100,000 goal - so close!!! It's the shortest, but most crucial. I can't sponsor a mile, but I want to make a donation. Call 212-746-2763 or email [email protected]. 1945 W CR 419 Suite 1141-136, Oviedo, FL 32766 US.